It is road bike cycling by PINARELLO OPERA after a long time. 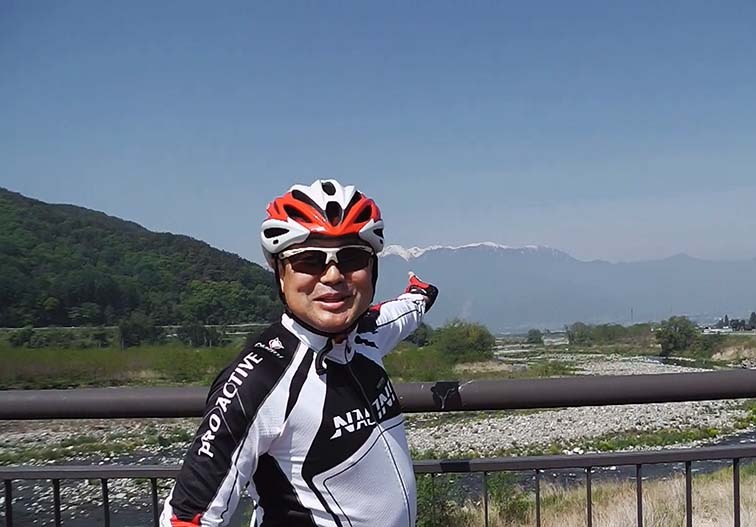 It is the cycling for the first time in a half-year. No problem because i riding a bike often. Since ride only good season. Since it is cold, I am disagreeable in winter. Since it is hot, I am disagreeable in summer. That's why she does not ride a bike this half a year. She began using the binding from last year. She fell off her bicycle in the Lake Hamana. 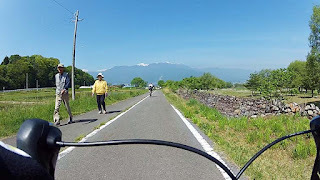 After that, We went to Gujo , Itadorigawa , north of Lake Biwa. She got used to the binding a little. She does not use it half a year. She would have gotten the sense? Because it is a little worried, I want to select a course where automobile traffic is low. It is safe in case of a bikeway. Previously,Mibukawa in Ina was good by KHS . For pedestrians and bicycles, course of moderate distance. There is almost no slope. The best for getting used to ride. The bicycle was put on the car and we went to Ina. A bicycle is assembled and started after arriving in Ina. Since it was fine, the mountain with snow looked beautiful. We go the right of a river to the upper stream. And the course which goes down left-hand side was chosen. The crack of the road surface has increased. It has been painted red. When go on the right-hand side of a river, it goes to the upper stream. Therefore, it is felt flat although it must be an ascent hill. It is easy to go. This course is not only for a bicycle. There are walker and runner. Outlook is good way because it is a straight line. Therefore, those persons can be discovered early. There is almost no crossing. In the outside of a course, it is a rice field. Many people were transplanting rice seedlings. I was riding pleasantly such. I got bored in second rounds. Because the scene is the same. I have memorized the stone of a road surface, and the crack of a road surface. The ant which is walking has also been memorized. Get used to binding was purpose. But she has kept a long time. So it does not become the practice of mounting or dismounting. In spite of having come to Ina? To the time of lunch, it is somewhat early. 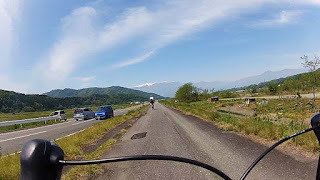 Does we go to Lake Suwa? It was written to the road signboard as "Takato." 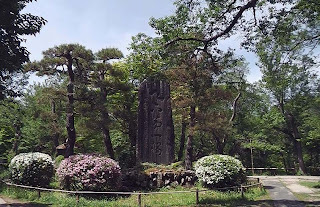 The Takato-joshi is famous for cherry blossoms. We climb on the riverbank from a cycling course. 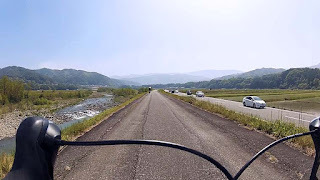 Since there is a side street, a riverbank can run safely. From the middle, it is not a river bank. There is no side street. It will be uphill from there. I do not like is uphill. Way to climb to the castle at the end. Because it is a castle. Because it is a fort. It is located in the place which is hard to be invaded. I got off the bike and climbed on foot . 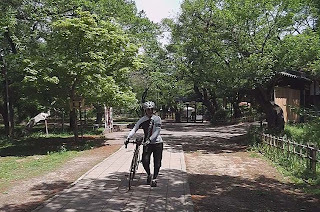 I will a walk through Takato-joshi Park. It is not the season of cherry blossoms. Not Sakura, but it is a prominent spot in the region. I had thought that there are some people. However, no one at all. The souvenir store was closed. The parking was also closed. It was a lonesome park. We return After a walk. As soon as we start, we arrived to cycling course. Cycling course also toward the downstream. 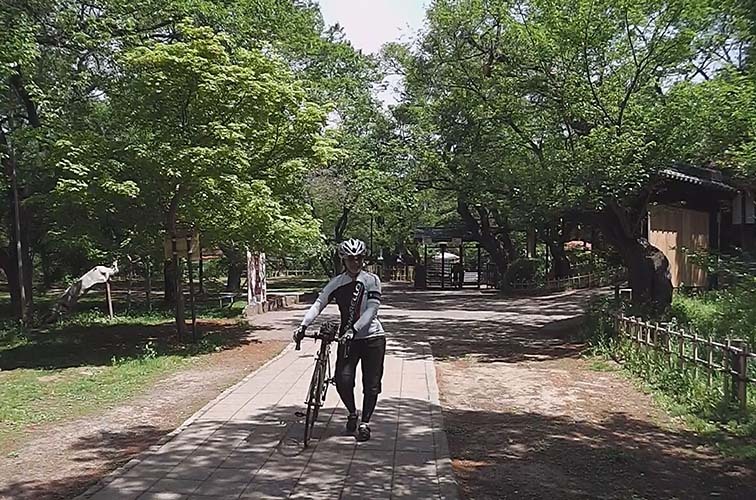 Cycling of this time was a short distance, but I was able to enjoy.